The Director of Communications and Community Partnerships will lead Sheff Movement coalition [“SMC”] efforts to build public support for its program of achieving quality integrated education in the schools of Greater Hartford. He/she will oversee SMC communications with and SMC organizing activities in the communities of Greater Hartford. He/she will have charge of coordinating SMC activities with school districts, government agencies, nonprofit organizations, and other institutions committed to providing quality integrated educated throughout the region. Read the job description here. Please share this news with your networks! Send a resume and cover letter that demonstrate how your experience and skill set meet the qualifications for this role to Philip Tegeler (ptegeler@prrac.org) using the subject line of “Sheff Director of Communications and Community Partnerships.” Applications will be accepted on a rolling basis until the position is filled. No phone calls please. You can also view this posting directly at the Sheff Movement website. Click below. For more information, please contact ConnectiKids, Inc. at 860-522-8710 and check out our website www.ct-kids.org. Please e-mail Kiera Steele, Program Coordinator at ksteele@ct-kids.org if you have additional questions. Dream Camp is looking for Passionate, Caring, and Reliable students to take part in this year’s After-School Mentoring Program. Mentors will work with students on completing homework, building life skills, and self-enrichment through fun activities. Mentoring positions are paid (2 day commitment). Flexible non-paid volunteer positions are also available. Please Check Us Out!! 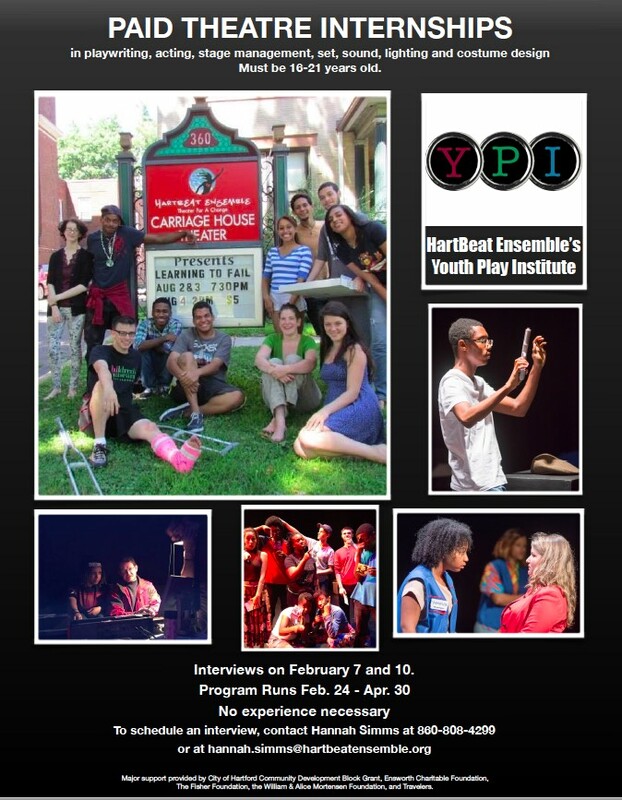 HartBeat Ensemble’s summer Youth Play Institute still has slots open for HARTFORD RESIDENTS! 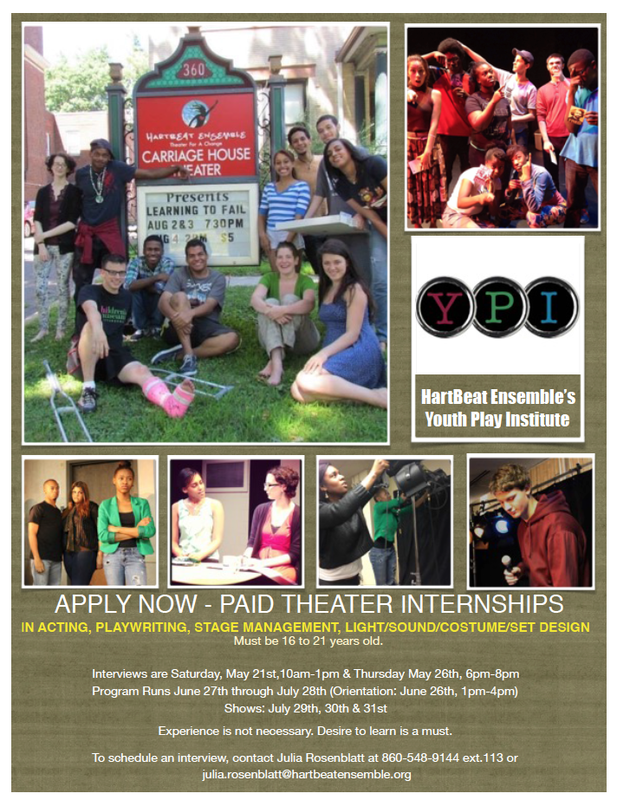 Young people between the ages of 16 and 21 years old who live in Hartford and might be interested in a paid internship in acting, stage management, set design, sound design, costume design or lighting design. Are you a Hartford parent or guardian trying to find programming for your child this summer? Check out these guides prepared by the Hartford Public Schools below in English and en español. Learn more about summer school, meals, and programs too here. Source: Hartford Public Schools, 2016. Trinity College seeks an outstanding teacher and teacher educator to serve as an adjunct Lecturer and Director of Science Education for Teaching Experiences for Undergraduates Program at the Hartford Magnet Trinity College Summer Science Academy at Trinity College. The Director of Science Education will be a member of a project team for a unique partnership funded by the National Science Foundation. The candidate will (1) work collaboratively with a team to develop a Methods in Secondary Science course with practicum for summer undergraduate interns (beginning June 6 and ending July 22), which the candidate will also teach; and (2) lead and train a group of five local science teachers/mentors in observing and providing feedback to the undergraduate interns during the 7-week summer semester. The Director will also mentor, supervise, and provide feedback on classroom teaching for 12 undergraduate student interns who will develop and teach a 4-week summer science course to urban secondary students attending the Hartford Magnet Trinity College Summer Science Academy. This is a summer appointment with a possibility for continued appointment in future summers and participation in organizational meetings throughout the year for this project. Applicants must have at least a master’s degree in science or education and experience is desired in the teaching of secondary science methods and practicum courses. Applicants must also have significant experience in secondary science teaching and in the teaching and supervision of new teachers; an ability to work closely and productively with colleagues; a deep knowledge of the issues of secondary science education, multicultural education, and adolescent development; significant awareness of current issues in schooling and teacher education; and special skills and experience in working with urban and minority populations. State of Connecticut teacher and/or administrator certification is recommended. The candidate may be needed to participate in scientific fieldwork, which may include walking around or off campus at data collection sites. A complete application consists of a cover letter, resume or curriculum vitae, and three references (names and contact information). Compensation is competitive and includes a housing/travel allowance. Review of applications will begin on March 4, 2016 and will continue until the position is filled. To apply, please go to the following link: https://trincoll.peopleadmin.com/.